The Alleghany County School Board held its regular monthly meeting at the Central Office Complex in Low Moor on Monday, August 15, 2016. During the meeting, the School Board recognized ACPS employees for their work for the area's flood victims and several for their dedication in the classroom. 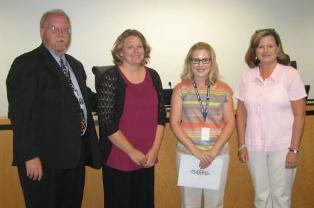 AHS staff members were commended by the School Board for their recognition by the VSBA. Pictured left to right are Superintendent Gene Kotulka; Melinda Hinkle and Corey Bowles, AHS staff; Jan Hobbs, Director of Assessment and Accountability; and Jennifer Seckner, School Board Member. The School Board recognized MVES staff members for their work to collect backpacks and supplies to assist area flood victims. Pictured left to right are Gene Kotulka, Superintendent; April Easton, MVES Principal; Sandy Moss, MVES teacher; and Jennifer Seckner, School Board Member.